De' Shazy Events and Entertainment Brings . . .
follow this event page for more updates . 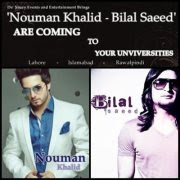 . .
'NOUMAN KHALID & BILAL SAEED' ARE COMING TO YOUR UNIVERSITY FOR LAUNCHING OF THEIR ALBUM !